This guest post comes from Barry Gardner, mastering engineer at Safe And Sound online mastering. Equalization is an incredibly powerful tool used in virtually every area of audio production including music recording and mixing. A lot of people initially feel equalization is a complex process but I would like to explain it as simply as possible but embellished with enough technical information to make it useful and valuable. At it’s most basic implementation an equalizer could be described as a tone control such as that on a hi fi amplifier. On an amplifier there are just 2 tone controls, bass and treble, as you turn the knob in either direction you either get an increase or decrease in the amount of bass or treble in the music, this is known as altering the tone. When thinking of eq it is useful to imagine a horizontal line with the audible audio spectrum running from low frequencies (left) to high (right). Adult humans can hear from around 25Hz to around 20kHz (best case scenario). An equalizer allows specific frequencies of the spectrum to be focused upon and amplified or attenuated (reduced). Successful equalization relies on accurate monitoring, if there is a deficiency in the quality of the monitoring or the room acoustics successful equalization will be difficult. Adjusting tone in a meaningful way relies on monitoring and acoustics coupled together as a reference system which is reasonably accurate. From a system where there is reasonable accuracy, there is basis for action. You may also try using headphones if you do not have loudspeakers but ensure you listen at lower volumes than normal as extreme eq boosts can produce high sound pressure levels (volumes). 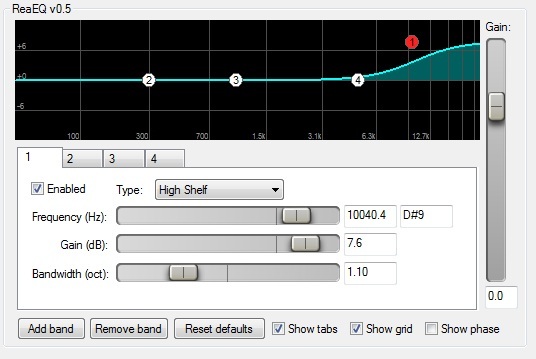 Some equalizer filters have common controls and some do not. Common controls are explained below. Frequency – this defines at what frequency the filter will be making changes to, the change can occur at, below or above the selected frequency depending on the filter used. Gain – This defines how much boost or attenuation will be applied, it relates primarily to low shelf, parametric and high shelf eq’s that will be discussed shortly. 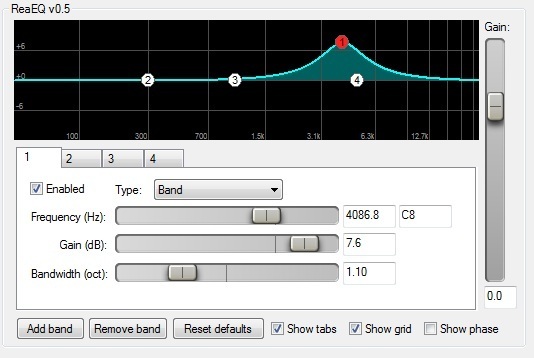 Bandwidth – a control particular to the parametric equalizer, this control determines how wide a range of frequencies will be adjusted either side of any selected centre frequency. 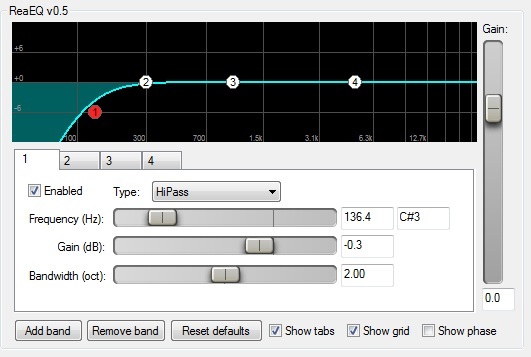 Cut off – This parameter is particular to high pass and low pass filters, it is akin to frequency. Historically it has been known as ‘turnover frequency’. There are 5 common types of equalization that one might encounter on either a hardware equalizer or a software plug in. We will run through them from the lows to the highs. Each has a different characteristic and this will be explained including a practical example of where it might be used. There are other filter types but these are the most commonly encountered in music production. 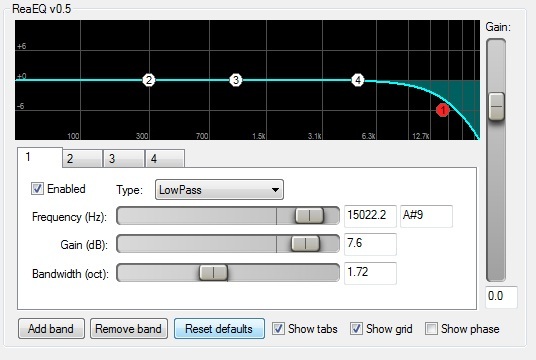 A high pass filter is a simple eq where all frequencies below the cut off point are reduced. Also known as a Low Cut Filter. This filter is good for reducing low frequency energy that may be undesirable such as stage rumble, sub sonic noise from traffic and can help with vocal pops. A low shelf eq allows a cut or boost of all frequencies below the cut off frequency. This is a good general and broad bass adjustment equalizer, common use would be to enhance the weight of an instrument in it’s bass ranges. A parametric equalizer allows a boost or cut at any given frequency and has an additional control called a bandwidth. A very flexible type of eq that has uses across the spectrum. A good example would be to add presence or attack to a snare drum. 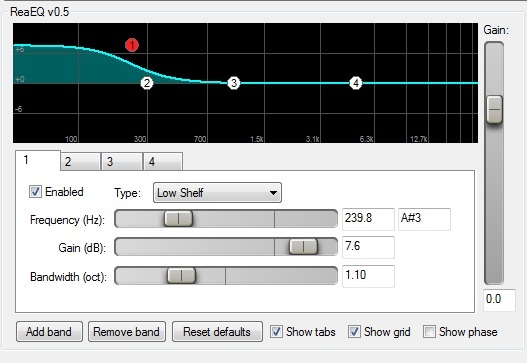 A high shelf eq allows a cut or boost of the frequencies above the selected cut of frequency. This eq is very useful for enhancing the very high frequencies, it can add a sense of space, brightness or clarity to a recording. It is also very usable as an eq for cutting overly bright or harsh sounding sources. A low pass filter reduces all frequencies above the selected cut of point. Also known as a High Cut filter. This eq is very good at removing the high frequencies that may be associated with brightness and sharpness. If there is too much treble in a source it can sound thin, it is often used in conjunction with other eq to complement it’s use. So you have had a basic technical explanation of eq. In practice learning to equalize can take some time. If you have just started recording and mixing music you can get into a situation where it is information over load. In general I think it is a good idea to split the learning process into to ear hand co-ordination and actual practical use in a mix. I suggest 3 sources to practice eq on. 2) A full music mix down. 3) A kick drum, snare, hi hat and bass line mix. I suggest making a recording of yourself reading a passage of words that you can put on a loop and also importing a fully mixed track onto a DAW track. These are frequency rich sources for eq practice because the human ear is very sensitive to changes in the human voice and a full mix has the entire spectrum of frequencies within. In addition you may wish to create a simple kick snare and hi hat pattern and try your eq skills on this, this is a little less rich and you may be able to hear further details and affects of the equalization you apply. I recommend fairly extreme settings at first such as a boost or cut of 8dB, you can sweep your frequency control for the various types of filters and listen to the results. After some time you will develop ear to hand co-ordination and this will help you make euphonic eq decisions in your music mixing. Check out Understanding EQ by Joe Gilder, an HD video tutorial series designed to accelerate your learning of this most essential mixing tool. It is really good article for beginners, well done Barry!